Dedication ceremony today in Huntington, NY for roadside historic marker! The historic roadside marker in Huntington, New York (Long Island) became official today with a brief ceremony at Wall and Main Streets commemorating a 1913 event where the “Spirit of 1776” wagon used by suffragist Edna Kearns and others was part of a parade and suffrage rally. 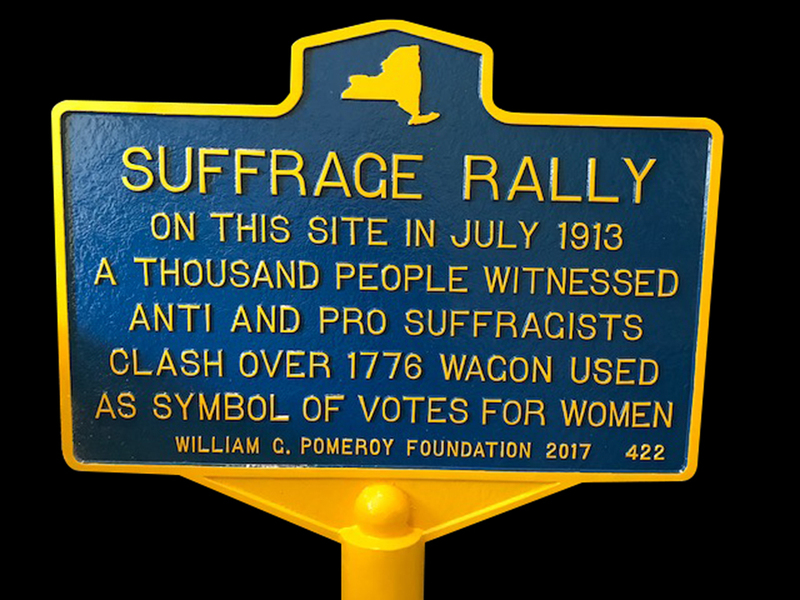 The Long Island Woman Suffrage Association applied for and received funding for the roadside historic marker through the William G. Pomeroy Foundation. The foundation has installed hundreds of historic markers throughout the State of New York. According to Pomeroy officials, the suffrage history roadside markers have been especially popular. For more information, follow Suffrage Wagon News Channel (SuffrageWagon.org). Suffrage Centennials has been publishing since 2013. This entry was posted on April 24, 2018, in Events and tagged "Spirit of 1776", Edna Kearns. Bookmark the permalink. ← “Votes for Women” exhibit on view at New York State Museum to Mother’s Day 2018!